In the late sixties, a priest comes upon a gruesome sight in a mausoleum. Another priest has torn a group of people to shreds and has demonic black eyes. Twenty-five years later, the insane priest is being held in an asylum and two college freshmen have been assigned to get a picture of him as part of a fraternity hazing prank. As is required in a horror movie, they accidentally let the killer priest out to start a new murder spree. 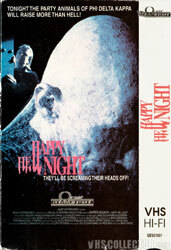 Despite the rote plot, ‘Happy Hell Night’ is a step above most low budget horror movies of its era, largely due to an effective monster. The killer priest is pretty creepy looking, and the low key way he goes about stalking his victims adds some great eerie tension. For a guy who seems to have no problem tearing people apart with his bare hands, he seems to really enjoy getting his hands on a mountain climbing pick. The movie also tries to give its characters a little bit more than paper thin characterizations. It’s only partially successful as the cast still consists of douchey frat bros you don’t mind seeing get a pick in the head. The finale is a little bit of let down thanks an unfortunate sped up film sequence and a pretty hokey final line, but up until those moments, it's a enjoyable and very competent horror film.